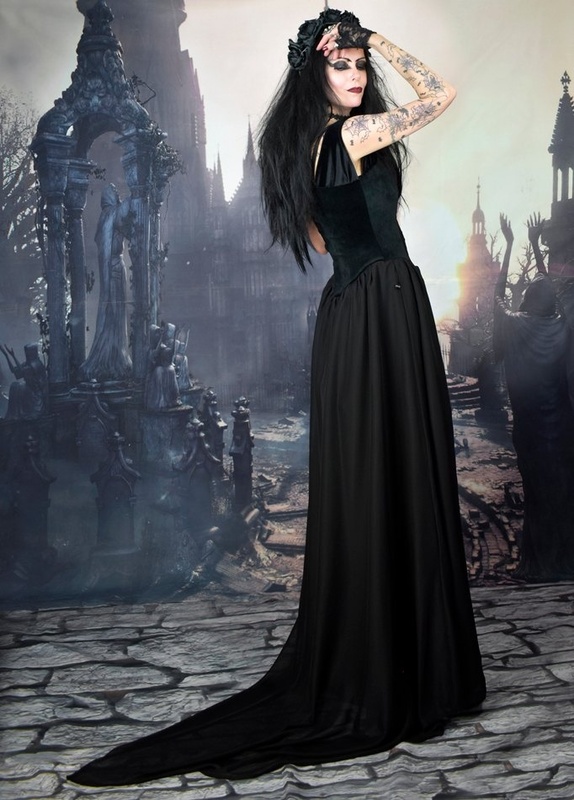 The stunning Princess Spookerina Gown, only from Moonmaiden Gothic Clothing - it's gorgeous! <br> <br> The bodice is made from steamed velvet, with a lace overlay on the centre panels; it fastens at the front with hooks and eyes, and has gathered off-shoulder sleevelets. The sweeping chiffon skirt has a train, and is lined with an antistatic underskirt and two layers of net.<br> <br> It's worn in some of the pics with the Princess Spookerina Bolero! The stunning Princess Spookerina Gown, only from Moonmaiden Gothic Clothing - it's gorgeous! The bodice is made from steamed velvet, with a lace overlay on the centre panels; it fastens at the front with hooks and eyes, and has gathered off-shoulder sleevelets. The sweeping chiffon skirt has a train, and is lined with an antistatic underskirt and two layers of net. It's worn in some of the pics with the Princess Spookerina Bolero!